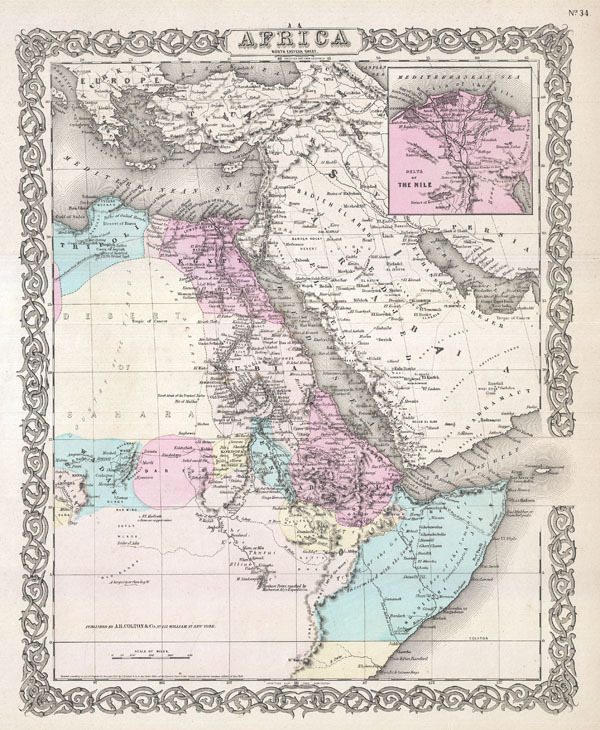 A beautiful 1855 first edition example of Colton's map of north eastern Africa. Covers from the Mediterranean south as far as Mount Kenya, west as far as Tripoli, and east to include most of Arabia. This is one of the first American map to depict Mount Kenya. Shows the explorations of that Arab explorer Mohammad Ali in search of the source of the White Nile. Also identifies the semi-apocryphal Mountains of the Moon, or Jebel el Kumert, running in an unusual speculative north-south configuration between Mount Kenya and Abyssinia. Throughout, Colton identifies various cities, towns, forts, rivers and assortment of additional topographical details. An inset map in the upper right quadrant details the Nile Delta. Surrounded by Colton's typical spiral motif border. Dated and copyrighted to J. H. Colton, 1855. Published from Colton's 172 William Street Office in New York City. Issued as page no. 34 in volume 2 of the first edition of George Washington Colton's 1855 Atlas of the World.